Betfair is the world’s leading sports betting exchange. A few years ago Betfair also added a sportsbook to their site which makes them a great choice for punters. They offer a large amount of betting markets and sports and you will also benefit from great odds in their betting exchange. We will show you which payment methods are available to deposit and withdraw funds from your Betfair account. Please check the table below if you are looking for detailed information about the Betfair payment options. We have compiled information about withdrawal times, process fees, and transaction limits. There are several different ways to deposit funds into your Betfair account. In addition to the most popular eWallets such as Skrill and Neteller, you can also fund your account by using credit cards, bank transfer, and paysafecard. You can use credit cards like VISA and MasterCard to deposit funds to your Betfair account. Credit cards are a fast and convenient way to transfer funds to your Betfair account and are therefore considered to be the number one option here. When making a deposit using your credit card there will be no additional fees and your funds will be available immediately. Skrill is the number one eWallet at Betfair. It was previously known as Moneybookers and is the largest eWallet in the world. It’s really convenient to use and just like Neteller, you won’t be charged any fees. Skrill is also offering another service called Skrill 1-Tap. This method allows you to put funds into your Betfair account from basically any device by pressing a single button. You can use Skrill 1-Tap from your computer or mobile device. The transaction limits for Skrill transfers are also quite high and payments are processed quickly. PayPal is an official Betfair payment method and the next eWallet on our list. You can use PayPal to deposit and withdraw funds at Betfair. There are no fees on deposits and funds will be available in your betting account immediately. However, there is a minimum of €6 for deposits and you may not deposit more than €8,750 at once. Funding your Betfair account using paysafecard is another great choice. The minimum deposit amount for paysafecards is €10 and the maximum amount is capped at €500. Regardless, funds will be available immediately and you won’t be charged any additional fees. Paysafecards are a secure way to transfer funds since you will not be required to provide any personal details when purchasing them. Betfair accepts deposits made using this popular eWallet by customers from most countries. Neteller is a great online wallet, which allows you to send and receive funds from almost every popular sportsbook. When using Neteller as your preferred Betfair payment option, you won’t be charge any fees. There is a minimum deposit of €15 and you may not withdraw more than €45,000 at once. Customers can deposit funds into their Betfair account using Bank Transfer. It is a secure and convenient deposit method, however please be aware that transactions may take 2-5 banking days to be processed. Bank transfers to Betfait are a great way to move large funds since there is no actual deposit limit. Use your unique Betfair customer account number as a reference for your transfers. Once the funds have been cleared, they will show up in your betting account. 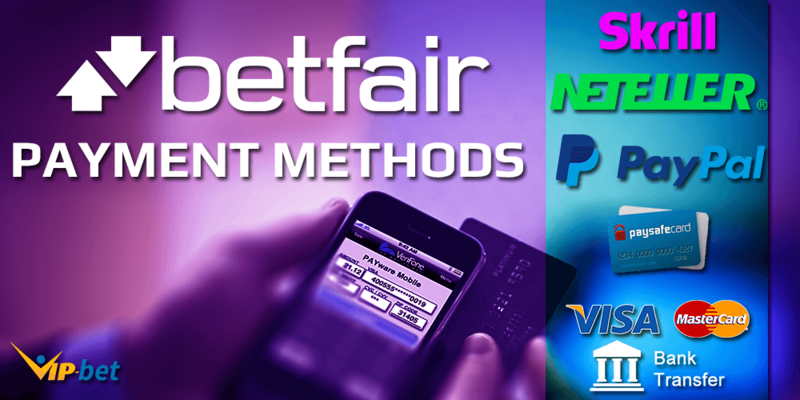 Which Betfair Payment Method is the Best? As you may have noticed, eWallets are the most convenient way of depositing money to your Betfair account. Our eWallet deals will also give you some special benefits on top if you sign up with Skrill, Neteller, or ecoPayz through us. You will basically receive additional cashback on your transactions, benefit from higher transfer and withdrawal limits, and lower fees in general. Please check out our recommended deals by clicking on the link below. Trust us – you will not be disappointed! Betfair provides you with several methods to withdraw your funds. Withdrawals are usually processed quickly, especially when using an eWallet. Betfair also does not charge fees for most withdrawal methods. Withdrawing money to a credit or debit card usually takes 2 working days. The longest it will take to receive your funds is 3 working days. Customers can receive withdrawals with VISA, VISA debit, Maestro, and MasterCard. You can only withdraw money to a credit or debit card you have already used to deposit money to Betfair. Making withdrawals to your Skrill account is really easy and it rarely takes a long time to receive your funds. It is guaranteed that you are going to receive your funds within 24 hours after requesting a withdrawal. Betfair is not charging fees when withdrawing money to your Skrill account and you can also cash out your funds using your Skrill MasterCard at an ATM. Skrill can therefore be considered to be one of the best Betfair payment options when it comes to retrieving your funds. Neteller is another great method to withdraw money from your Betfair account. Just like Skrill there are no fees charged and your funds are available within a short amount of time. Neteller also offers you the option to withdraw funds using an ATM card. The minimum cashout is £10 and you may not withdraw more than £50,000 at once. Withdrawals to PayPal are usually processed within 12 hours and Betfair is not charging any additional fees. It will take no more than 24 hrs to receive funds. You can also choose to request a Web Money withdrawal. It takes 12 – 30 hours until you receive your funds. Cheque is the final option to withdraw funds from your Betfair account. In comparison to the above mentioned methods, it is going to take quite a while to receive your funds. You will have to wait 10-30 working days until they arrive. In order to to verify your Betfair account you have to be logged in to your account. Betfair is required to verfiy every account holder they have. One way of doing so is by providing documents so they can verify who you are. It is necessary in order to comply with legal requirements. Betfair will attempt to electronically verify your account. With Betfair you will experience extremely fast withdrawal times. When using an eWallet like Skrill or Neteller, it will rarely take you longer than 12 hours to receive your funds, which is fantastic. If you decide to cash out using bank transfer or credit cards it will take a little longer, but not more than 5 working days in any case. However, if you want to receive your funds using Cheque it will take up to 30 working days. Does Betfair Support Credit Card Deposits and Withdrawals? Yes, Betfair accepts credit and debit cards as your preferred Betfair payment method. You can use them to transfer funds to your Betfair account and to withdraw your money. You can find more detailed information about credit card payments in our Betfair Payment Methods overview above. Does Betfair Support PayPal Deposits and Withdrawals? Yes, Betfair recently added PayPal as a payment method. You can now use to to move funds between your Beftair account and your PayPal account. Check our detailed information above if you want to see how long a withdrawal takes.